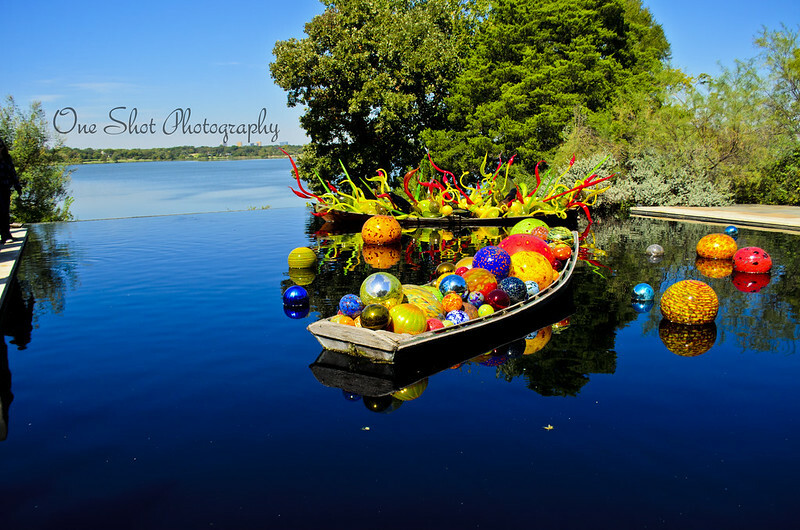 A couple of weeks ago James and I went to the Dallas Arboretum and saw the Chihuly installations that are on exhibit right now. They were absolutely beautiful, and you know I have some pictures to share with you as well. First, I thought it would be fun to find out some information on this phenomenal artist. 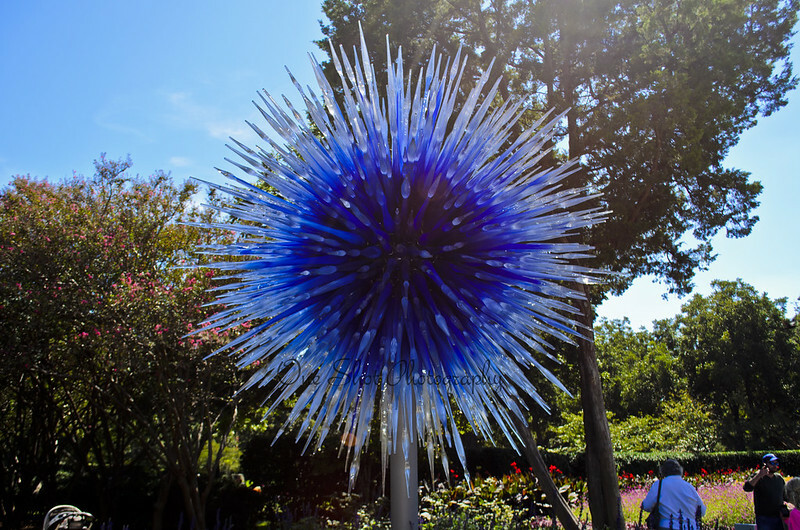 Dale Chihuly was first introduced to glass at the University of Washington. 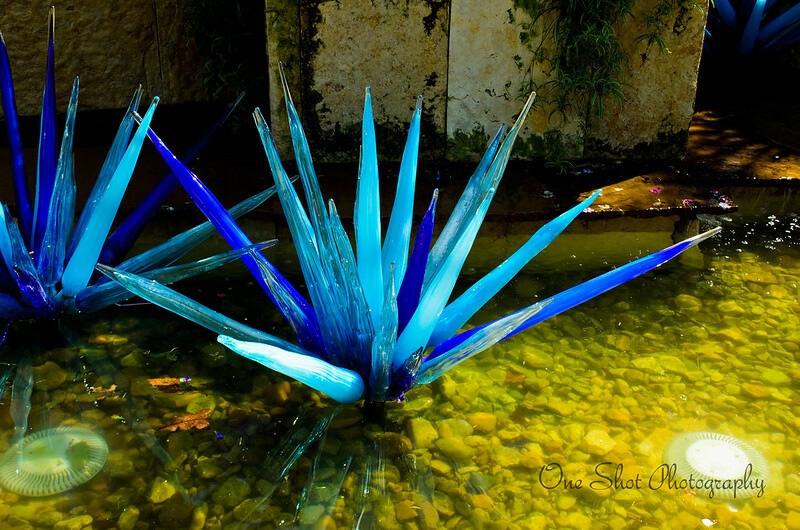 After graduating from the University of Washington, Chihuly enrolled in the countries first glass program at the University of Wisconsin. After this he studied at the Rhode Island School of Design, where he initiated a glass program and taught for more than ten years. Chihuly worked at the Venini glass factory in Venice, where he saw an approach to glass blowing that is intrigal to the way he works today. 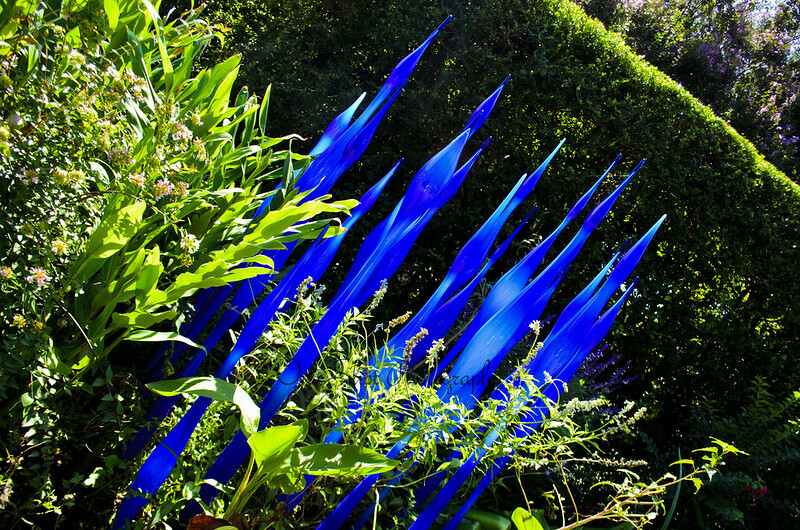 This is one of my favorite sculptures because of the amazing blue color against the green of the plants. I found it striking. I did a little playing with this picture when I got home. Taking the color out of the rest of the photo and leaving blue. 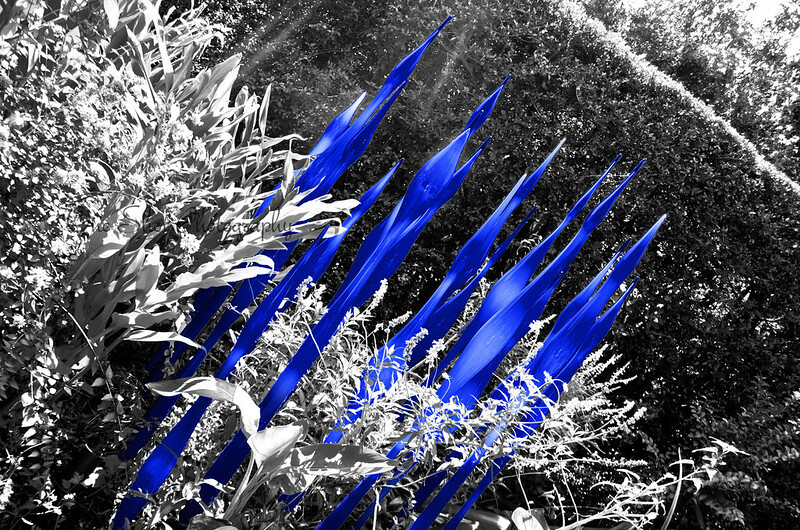 There were installations of reeds and several other Chihuly staples throughout the garden. Chihuly first filled boats with his glass elements in Nuutajärvi, Finland during the Chihuly over Venice project in June 1995. After several days of glass blowing in the hot shop, the team made temporary installations along the Nuutajoki, the river nearby. Chihuly then filled it with Chandelier parts and other glass forms that were blown during the Finland trip. (Audio) The colors were truly amazing against the artificially dark water, in the bright Texas sun. 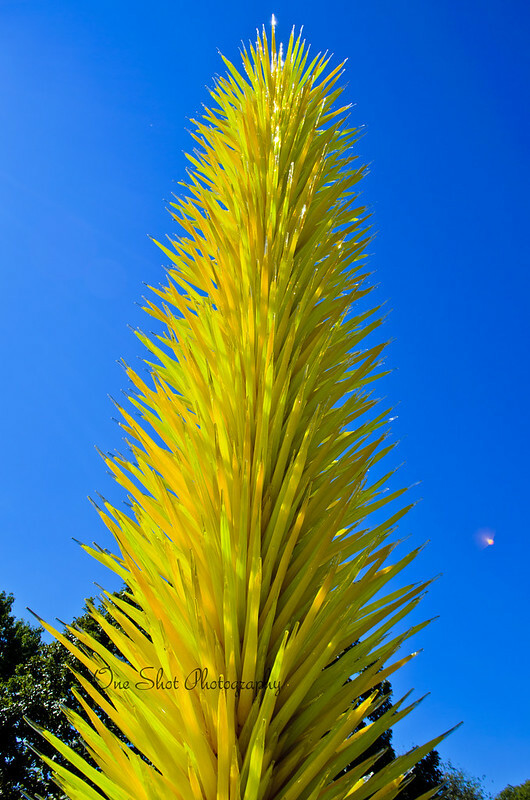 The Yellow Icicle Tower shoots up 30 feet and is a perfect example of Chihuly’s desire to mass color for dramatic effect. The combined elements create what Chihuly once described as, “a core of color.” Among the things for which Chihuly is most known for are his monumental blown glass sculptures. (Audio) This Lemon Yellow tower could be seen from across the Jonsson Color Garden. 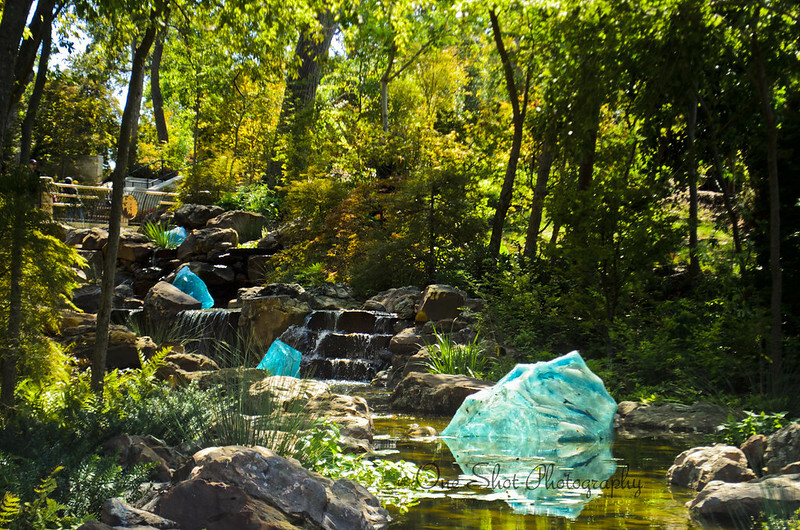 If you have the time, it is well worth the drive to see the Chihuly Exhibit at the Dallas Arboretum. 1 of the most effective that I’ve seen. This blog unquestionably has some details on subject that I just wasn’t aware of. Thanks for bringing this things to light. Some truly exceptional articles on this internet internet site , regards for contribution. Youre so cool! I dont suppose Ive read something like this ahead of. So nice to acquire somebody with some original thoughts on this subject. realy thank you for starting this up. this web page is some thing which is needed on the internet, an individual with a little originality. useful job for bringing something new to the net! Thank you so much. I really enjoyed the exhibit, I love seeing things like this. Thank you for the kind words, I need to get back in to the swing of writing on a regular basis. With a new baby…it can be difficult. Hello would you mind stating which blog platform you’re working with? I’m planning to start my own blog soon but I’m having a tough time choosing between BlogEngine/Wordpress/B2evolution and Drupal. The reason I ask is because your layout seems different then most blogs and I’m looking for something unique. P.S Apologies for being off-topic but I had to ask! I’m sure they’ll be benefited rom this site.